Manufacturer & Supplier of Polycarbonate Sheets & Polycarbonate Sheet. Our product range also comprises of Buildex Self Drilling Screws, Roofing Sheets and Decking Sheets. 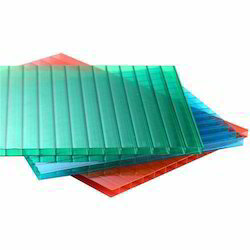 We are prominent entity engaged in manufacturing and supplying Polycarbonate Sheet. Polycarbonate is a polymer with a unique blend of desirable properties. This polymer can be given shape by different processes, which include injection molding, blow molding, extrusion and thermoforming. Polycarbonate roof sheets are manufactured by the process of extrusion. Polycarbonate roof sheets are commonly called transparent steel due to their wonderful impact resistance and glass alike clarity. Polycarbonate sheets possess superb impact strength (Virtually Unbreakable). Excellent flexure strength hence can be cold curved or even cold bent into simple shapes. Very high light transmission of up to 90%. Superlative fire performance ( Self-extinguishing) and TAC approved. Light in weight hence easy to handle & install. Available in tailored lengths, hence minimum wastage. High-temperature tolerance (from -40°C to +130°C). Excellent thermal and electrical insulation properties. Being an engineering thermoplastic, polycarbonate sheets can be thermoforming to make them suitable for a host of different applications where high performance is sought in combination with transparency/ translucency. These plastic corrugated roof sheets can also be engineered to suit various innovative applications in the future.